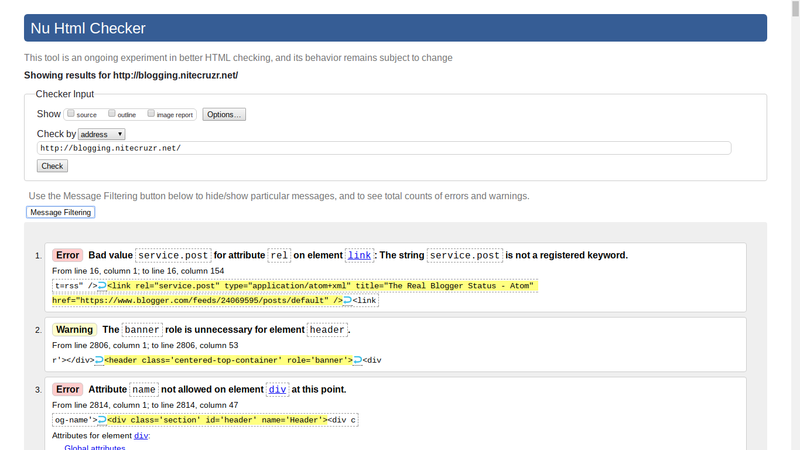 I don't know how to use W3C Validation, there are always errors displayed for my blog! And we see periodic questions about validation - and sometimes reports about broken templates, with blog owners following the validation advice, blindly. 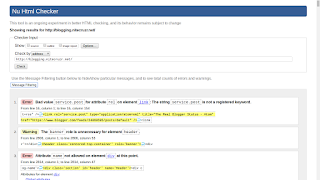 W3C Validation produces hundreds of errors, for every blog page. I Tried Validation, For This Blog. I used to tear my hair out, trying to fix my W3C validation errors, for this blog. Check out the validation log, for this blog, as an example. See the size of the scroll tab? That's a 20 page report - of critical errors, in the blog home page. See the size of the scroll tab? This display shows just the first page, of 20 or so. Validation Is Useful, For Static Websites. W3C validation is designed for HTML based, static websites - that are centrally located. Blogger blogs are XML based, and dynamic - and use the Google Content Delivery Network, which serves blog content from dozens of different data centres, worldwide, based upon the location of each individual reader. With the Google CDN delivering content locally, to many readers, distance related network issues are less important - and with Blogger templates being maintained and tested by Blogger Engineering, a lot of the issues identified by validation are not easily resolved by the typical blog owner. If you publish a Blogger blog, using a Blogger supplied template, work on content. Blogger manages the network settings, relevant to your blog, as it is served by the Google Content Delivery Network. You publish your blog - and let Blogger / Google worry about the networks, the servers, and the templates. It's possible that some blogs with third party templates, and non Blogger standard code, may benefit from validation. If your blog has a non Blogger template, you could check out Blogger Developers or Stack Overflow - and ask for advice there. Or, try contacting the person / site that provided you with the template, and see what they can tell you. But with a blog with a supported Blogger template, concentrate on content. Don't tweak the template HTML, unless necessary. Leave Blogger / Google to worry about network issues and the template. Some #Blogger blog owners concern themselves about third party network performance analysis. Learn why some performance analysis advice may be unnecessary - and can be harmful to your blog.